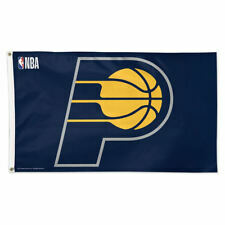 New Indiana Pacers Officially Licensed Flag Great for Hoosiers. Condition is New.Item in photo is the actual item you are bidding on, so shop with confidence. Any questions, let me know. Each item will include aNBA Approved Hologram which ensures quality construction, updated team logos, and authentic team colors. NBA Indiana Pacers 12" X 30" Large Pennant. Fly Your Team Allegiance Let the Neighbors know which team your Rooting for with our. 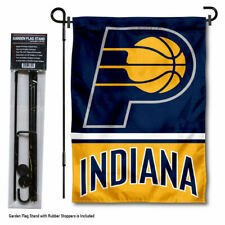 It includes your selected 12.5" x 18" Double Sided Indiana Pacers Garden Flag along with a Sturdy Steel Powder Coated Garden Flag Stand with 2 included Rubber Stoppers! Also, the stand is made of steel, is powder coated black for rust resistance, and the ground stake is made with double welds for extra durability. 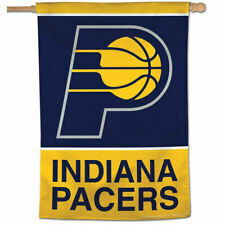 NBA Indiana Pacers 3' x 5' Large Flag. Fly Your Team Allegiance Show the Neighbors which team your Rooting for with our. Back is marked Wincraft Inc. Winona MN 55987 USA. Made for WinCraft in China. fish hook for pierced ears. Also included is our Adjustable Aluminum Flag Bracket. It is constructed of aluminum and adjusts from angles of 0 - 180 degrees at 15 degree intervals. The 6' Pole is our heavy duty two-piece aluminum flagpole which has a total length of 6 feet. Includes an apron, oven mitt, and a hot pad. Perfect for the #1 fan. Indoor or Outdoor use. 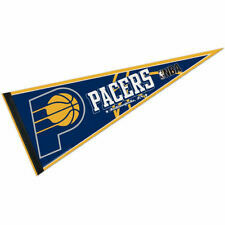 NBA Indiana Pacers 12" X 30" Large Pennant. Each item will include aNBA Approved Hologram which ensures quality construction, updated team logos, and authentic team colors. 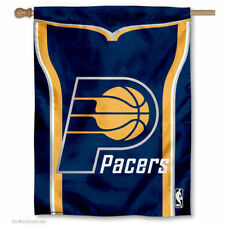 NBA Indiana Pacers Garden Flag. Since our Garden Flags are Two Ply Double Sided, the NBA Approved logos and lettering areViewable and Readable Correctly on Both Sides. Also, each flag will include aNBA Approved Hologram which ensures quality construction, updated team logos, and authentic insignia colors. A must have bath towel for a fan. NrMt-Mint condition overall. Also, played for the Dallas Mavericks, Seattle Supersonics, and Portland Trailblazers. Knitted long neck protects your clubs shaft. Embroidered with your favorite NBA team logos. Official team colors and logos. INDIANA PACERS 5" X 6" COLOR WINDOW CLING. Clean surface to be decorated, leave damp. Apply decal! Ultra decals stick to multiple surfaces and are removable and reusable. You get one (5) ultra decals on this sheet. This versatile decals can be used indoors or outdoors and will not leave a residue when removed. It's designed in the vibrant colors of your favorite MLB® squad and decorated with large team graphics. Fiber-reactive beach towel. 100% cotton. You get one (2) ultra decals on this sheet. Ultra decals stick to multiple surfaces and are removable and reusable. This versatile decals can be used indoors or outdoors and will not leave a residue when removed. Multi use decals stick to multiple surfaces and are removable and reusable. These have unique cut to logo shapes. These versatile decals will not leave a residue when removed. Made in the USA. Ultra decals stick to multiple surfaces and are removable and reusable. The plate is a great souvenir decorator piece. Made in USA. Keep checking back.who knows what you will find. INDIANA PACERS 5" X 6" COLOR ULTRA DECAL. Ultra clings stick to multiple surfaces and are removable and reusable. Can be used indoors or outdoors and will not leave a residue when removed! Indiana Pacers NBA Vertical Flag Licensed 28" x 40"
Designed to hang vertically from an outdoor pole or inside as wall decor. Text is correctly readable on one side. Printed in USA. Size 28" x 40". You can easily switch up your look with this pin on! Jacksonville, Florida 32254. 5245 Commonwealth Avenue, Suite 200. Send it to us at Follow the instructions below to ensure we continue providing the best possible service. With this Indiana Pacers 42" folding umbrella from WinCraft, you won't have to worry about getting wet or ruining your outfit. It's also decorated with Indiana Pacers colors and graphics to let everyone know that you support the best basketball squad. This remarkable 12" x 30" Cooling towel from WinCraft is just what your collection is lacking. This towel will instantly cool your skin and has striking Indiana Pacers artwork printed on it that will show your allegiance all season long! The bold and striking design of this Indiana Pacers decal will be difficult to miss as you cruise around the neighborhood! Material: 100% Vinyl. Product Details. Jacksonville, Florida 32254. 5245 Commonwealth Avenue, Suite 200. Material: 100% Vinyl-Coated Decal. Product Details. Jacksonville, Florida 32254. 5245 Commonwealth Avenue, Suite 200. Send it to us at Follow the instructions below to ensure we continue providing the best possible service. Get the perfect decal to let everyone know who you cheer for! This 3" x 10" Logo Perfect Cut decal from WinCraft is a great way to display your love for the Indiana Pacers. Printed Indiana Pacers graphics and team colors on this decal will ensure your love for your team is visible from any angle! Get the perfect item to let everyone know who you cheer for with these Indiana Pacers 4 x 4 decals from WinCraft! Featuring vibrant Indiana Pacers-inspired graphics, these decals are perfect for a die-hard fan like you. Get the perfect look to let everyone know you are a Indiana Pacers fan! Move over other drivers and give room to this beautiful, high quality Indiana Pacers bumper sticker. Complete your auto accessories and attach the Indiana Pacers to your favorite bumper and make your baby stand out. Everything you own emanates Indiana Pacers enthusiasm. This vivid Indiana Pacers decal has a simple, yet spirited design that will make your fandom difficult to miss as you make your way to the next tailgate party! The Indiana Pacers crest is more than just a logo, it represents a long history of hard-earned wins, losses and a dedication to the team all throughout. 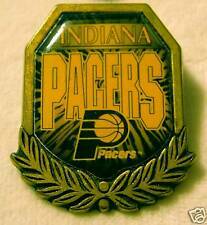 Give no second thoughts to pinning up your passion for your favorite team with this Indiana Pacers Primary Logo pin from WinCraft.